Review Context: I have played many sci-fi games, FPS games, and creation-based games like Minecraft. I played No Man’s Sky for a solid 3 weeks. Space is the final frontier. The mystery of the unknown has interested and motivated people and continues to do so today. 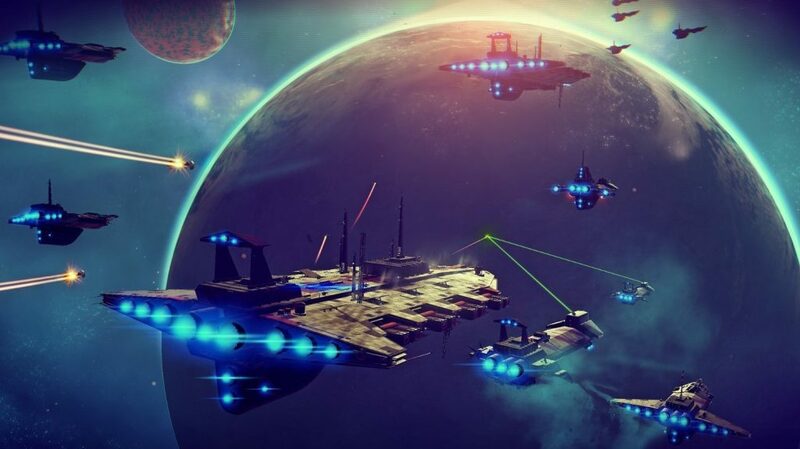 No Man’s Sky gives us the opportunity that we only dream about when reading and watching science fiction; the opportunity to explore and discover the endless frontier. With Quintillions of planets that are procedurally generated, No Man’s Sky gives us the freedom to explore. Go from planet to planet without any loading. Discover strange and interesting creatures and even meet alien races. It was the idea of this game that brought us all in and intrigued us. 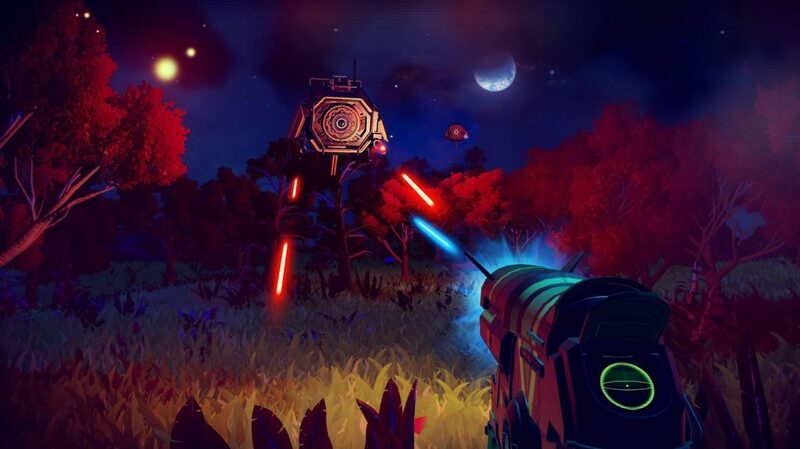 Unfortunately, the promises of No Man’s Sky may have been too good for their own good. No Man’s Sky starts you out on a planet with a wrecked ship and absolutely no clue of where you are or what you are supposed to be doing. There is no hand-holding in this game, which isn’t necessarily a bad thing, but it also makes the start of the game a bit confusing. From here you need to collect materials to repair your ship. This serves as a basic tutorial and these first few hours can make or break the game due to the sudden drop into the game. As you find materials you will begin to learn that certain colors, plants, rocks, identify as certain materials. You may discover some creatures, which you can then name, and register to earn some money. Once you have explored the planet to your liking and repaired your ship, it’s time for the exciting moment of leaving the planet, and with no loading, you fly into space to begin your adventure towards the center of the galaxy. This is where the general drop off the game can begin. You go through these same motions without end: Land, mine, discover, leave, and repeat. Eventually you get access to cool upgrades and more inventory slots for even bigger and better ships. Finding something new is always exciting, but it wears quickly. There is no story to No Man’s Sky. You are told to go to the center of the galaxy, but you are never told why you want to get there. You meet aliens who will provide blueprints for upgrades if you answer a question correctly. When you start the game you have no idea what these aliens are saying and there are thousands of words you need to discover. You discover these words on planets and you discover them one by one. Outside of breaking down language barriers, there is no sort of lore that I was able to discover in the time I played. While the focus on the game is the exploration, it really brings down the enjoyment when you realize that there isn’t much to discover outside of animals. The flying in the game (which you will be doing a lot of) has a lot of potential, but isn’t that great. The neat part is the fact you go from space to land without a loading screen, and distance gives you a real time estimation of arrival. Leaving one planet could leave an hour flight to the next. Now there are ways of reducing the travel time, which does require resources, though they are easily obtainable. The bad thing is that the flight controls are stiff. Flying at high speeds give you zero control over direction and flying slow still gives you a really slow turn time. This makes space battles annoying when enemies seem to turn on a dime. In atmosphere is worse, with bad reactions to your commands and an invisible barrier preventing you from getting close to the ground to prevent crashing. Ground combat is worse than the flying mechanics. 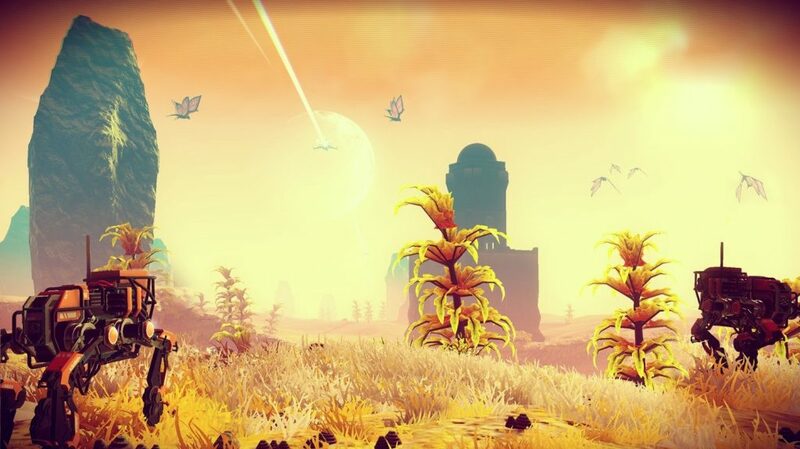 If you think of all the good things from the best FPS games in gaming today, you can throw all of those good traits out when it comes to ground combat in No Man’s Sky. Whenever you run of ammo, energy for mining, even life-support or shield, you always have to go into your inventory to refill everything. It doesn’t auto fill when you run low and makes you stop and have to play around in the clunky and slow menus. The enemies in No Man’s Sky are limited to some animals that are hostile and sentinels that patrol every planet that only seem to function to make sure you don’t mine too much of one thing. They run on a Grand Theft Auto wanted level system, so one circle (or star in Grand Theft Auto) they will attack, two they call in more, three cat-like sentinels come in, four brings bigger sentinels, and five bring the biggest walkers. All these are easy to kill, but if you don’t want to fight and risk dying then you can just walk into a building and they instantly stop chasing you…or hide behind a rock and they get confused and eventually stop. There isn’t much challenge to fighting and you will get attacked for really dumb reasons. The multiplayer in No Man’s Sky is confusing. You discover planets, systems, animals, planets, name them, and then upload them to the servers and they are forever that name. You can discover other player’s discoveries, though with quintillions of planets it may be a rare discovery. We were also lead to believe you may have an extremely rare chance to meet other players, but that seems to be false at the present time of this review. So multiplayer wise there really is none. You are alone in this massive galaxy, which is kind of a bummer. There are some really good things about No Man’s Sky. The music is great and feels like you are in an 80s sci-fi adventure. Then there is the ‘choose your own adventure’ element; every time you talk to an alien or interact with a large obelisk a small scenario will pop up, much like you would see in a ‘choose your own adventure’ book, and sometimes give you a couple choices. These make adventuring almost interesting and makes you feel like there’s something you are risking with these choices. The sense of discovery is exciting however long it lasts, and it will be different from person to person. I was skeptical about No Man’s Sky before launch and ultimately was disappointed by it. 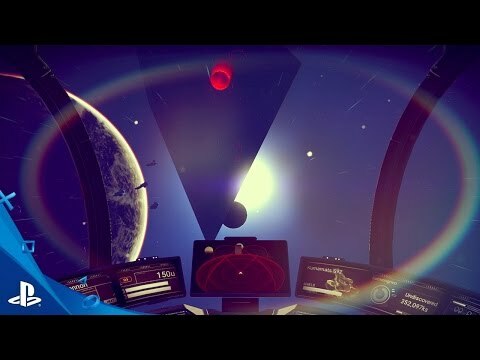 No Man’s Sky is by no means a bad game, but it also is probably something people should avoid until new content is added. It’s fun to start and it’s fun to discover, but that charm quickly wears off.